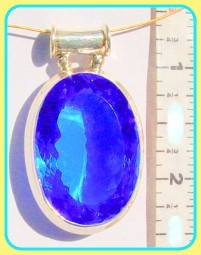 This pendant features a large, facetted blue quartz gem set in sterling silver. It was carefully shaped so that there is a smooth, wide surface area of skin contact over the throat or heart chakra. Facetted, laboratory grown blue quartz in 92.5 sterling silver. Gemstone measures approximately 22mm wide by 32mm high. Pendant measures approximately 24mm wide by 42mm high. Chain not included.